With so many services like iCloud and Dropbox getting hacked these days, it's no surprise that more people want to pull their data off the cloud. Instead of missing out on those great syncing features, though, you can create your own cloud storage service that you control with a service called ownCloud. With it, you'll get syncing files, notes, calendars, and more. The best part: it only takes about five minutes to get it set up. OwnCloud is free and open source software that operates as a very simple way to set up your own syncing, Dropbox-like cloud storage system on your own server or web site. It's robust enough that it has replaced Dropbox for me in all except a few choice cases. It's also quick and easy to set up, and doesn't require advanced technical knowledge. 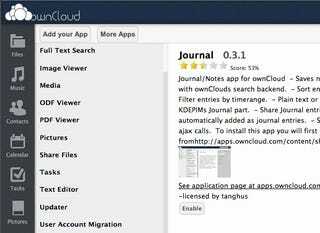 OwnCloud is about as powerful as Dropbox, but it also allows people to make and share their own apps that run on ownCloud including text editors, task lists, and more. That means you can get a little more out of it then just file syncing if you want. At the core of it, ownCloud offers up super easy file syncing from your desktop to the cloud. To get an idea of how it works, play around with the live demo here (it looks like the live demo might be down at the moment), and see a full list of its features here. Like Dropbox, you can access your files from anywhere, sync data, and share files with others. Beyond that, you also get a music player built directly into ownCloud, a simple place to store contacts, a task manager, a syncing calendar, a bookmarking service, and a robust photo gallery. You'll be able to sync ownCloud with almost any desktop or mobile calendar and contacts app. 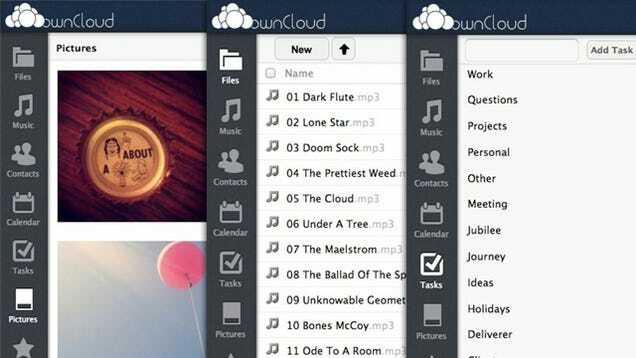 That means if you want to ditch the likes of iCloud, ownCloud makes it easy to do. A recent update also added a simple install method so anyone can start using ownCloud right away. A web host that supports PHP5 and MySQL (or SQLite): This might sound a little jargony, but all it means is that you need to sign up for a service like Dreamhost (if you haven't already). If you already have a domain name like http://www.yourname.com through a web host (and you should), you can probably install ownCloud in a couple minutes. It sounds complicated, but you don't actually need to deal with things like PHP and MySQL for the simple installation of ownCloud. It does it all for you automatically. Just make sure your hosting service supports them. A copy of ownCloud Server 5: You can install ownCloud in a variety of ways, but for our purposes we'll stick the simplest method: the web installer. If you know how to put a file onto your web site, you can install this. You'll just need to upload one file to your web host. A URL for remote access: Since you'll likely want to tap into ownCloud from anywhere, you'll need a URL for doing so. If you don't already have a domain name, you can buy one, but if you do it's incredibly easy to set up ownCloud in a subdirectory of your site. The nice thing about ownCloud is that it's compatible with just about any server you can imagine. We're going to stick with the simple web installer that works with an online hosting service, but if you want full control, it's easy to install on a Linux machine in your house, a number of service providers offer one-click installs, and hosts like Dreamhost even provide their own installation guides. You also want to take a look at your web host's Terms of Service to make sure they don't outrightly ban setting up your own cloud storage on their servers. Download and save the web installer to your computer. Upload the setup-owncloud.php file to your web space using your host's web interface or an FTP app (our picks for Windows, Mac, and Linux are a good place to start if you don't have one). Enter the URL of the setup file into your web browser. It should something like http://www.yourdomainname.com/setup-owncloud.php. 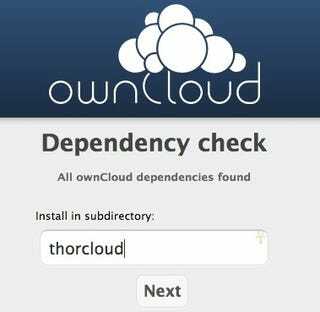 Follow the basic onscreen instructions to install ownCloud. After a couple of minutes it'll redirect you to the login page. That's it. It's incredibly easy to set up as long as your web server meets the basic requirements listed in the first section. If not, ownCloud's guide for manual installations covers just about every other instance you could possibly run into. Now that you have ownCloud installed on your web server it's time to set up the desktop sync so the files in ownCloud are the same as on your computer. For this, you'll need to install the desktop client (Windows, Mac, or Linux). Open up the ownCloud software on your computer, and select "configure." 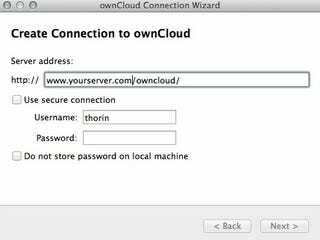 Add the URL of your ownCloud server, and your login credentials. Now, you need to select the files and folders you want to sync. Click "Add folder..." and select a folder on your computer. All files here will now upload and sync automatically to ownCloud. You can add as many folders as you like. As with Dropbox, you can also simply drag files into the web interface to upload them and they'll be synchronized both locally and in the cloud, and you can share files with friends by selecting the "share" option when you mouse over a file. For the mobile apps (Android/iPhone), you'll follow the same instructions to point the app to your ownCloud directory, then enter in your username and password. The mobile apps are notably barebones, but they function well enough for accessing files. Now that the basic file syncing is out of the way, it's time to get all your other stuff synced up. This means synchronizing your calendar, address book, and music. Click the Calendar icon on the right side. Now, just open the settings of your favorite calendar app, and add your account in the CalDAV section. All your appointments will be dumped into ownCloud and synced across any other devices you connect to it. Export your contacts from your address book into a VCF file. From ownCloud, select the "Contacts" sidebar, and click the gear in the bottom left corner. Click "Import" and select the VCF file you want to upload. It will take a few minutes to get your contacts uploaded, but once they're up, you can synchronize them with any address book that supports CardDAV (most do). 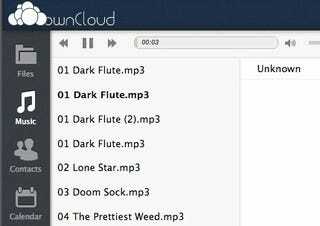 One of the most interesting things you can do with ownCloud is set up a personal cloud server for all your music. Just upload some MP3 files into ownCloud, and you immediately have access to them alongside a web player. That alone is useful, but you can also set up a desktop client to access those files. 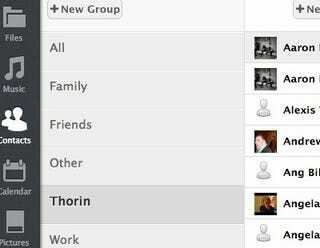 From the ownCloud web interface, click your username and select "Personal." In Tomahawk, head to the Preferences (Tomahawk > Preferences), and select "Services." Scroll down and select "Ampache." In the dialogue box that opens, enter in your ownCloud username and password, followed by the URL you copied above. Now, all the music you have stored on ownCloud will be playable in Tomahawk. If you're not a fan of the simplistic web player, Tomahawk works great. Now it's time to extend ownCloud's functionality further with apps. If you click your username from the ownCloud web interface and select "Apps" you're taken to a list of installable applications. You can also browse through a few more here. Journal: This is a simple journal and notes app that works with the Tasks app and the Calendar app. It also supports syncing if you're using a small selection of different apps on Linux or Android. 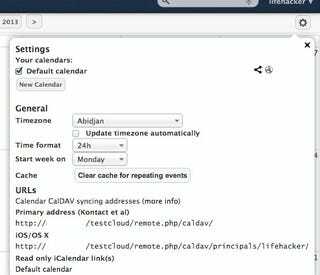 Tasks (available within ownCloud): Tasks is a simple to-do list that syncs with the calendar or stands on its own. Bookmarks (available within ownCloud): Bookmarks turns ownCloud into a nice little cloud-based bookmarks manager, complete with tagging, filters, and a bookmarklet to easily bookmark any page. Roundcube: Roundcube adds an email interface directly into ownCube provided your mailserver supports Roundcube and IMAP. That's just a taste for what you can add to ownCloud, head over to the apps page for a full list. The nice thing about ownCloud is that with the recently added web installer, pretty much anyone can get it up and running on their own web host in a matter of minutes. Once you're set up, you can extend that functionality as much as you want, or just use it as a cloud-based file syncing service. You won't find the same amount of in-app support on mobile devices as you would with Dropbox, but as a free, private cloud server ownCloud does its job very well.